It's bad enough that you grow up without a father, but to have him commit suicide when you're just five years old, must be worse. 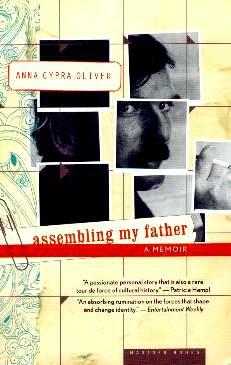 This is what author and daughter Anna Cypra Oliver had to live with. We are taken on a trip back some thirty years as she pieces together her father's life. He was born Jewish in Queens, New York, became an architect and moved to Florida and then out to Taos, New Mexico and lived a bohemian life with his young wife and two children. In April 1974, after his wife had left him and his two children were seven and five, and he drugging on cocaine, he shot himself in a rented room. Ms. Oliver didn't remember much about her father and some twenty years later, she pieced together some semblance of the man she called daddy. She diligently sets about getting answers from anyone who can help and this is her remarkable account of how she not only discovered her father, but also what made her tick. Not only did she find out about her father, she also learned more about her mother, who converted from Judaism to fundamental Christian. Ms. Oliver met her relatives and grew to understand her heritage, as did she meet with friends of her father who helped fill in the blanks. The things she discovered about her father weren't all that pleasant (he later smuggled drugs into the States) but they were all puzzle pieces. Much of the time it sounds like hearsay, which much of it is, I suppose, and you have to admire Ms. Oliver's determination. Conclusion - Sad and interesting. I stopped at page 210.